Kongsberg Maritime has been awarded contracts with Nanjing Jinling Shipyard Co., China to deliver power and hybrid systems to nine roll-on roll-off (ro-ro) vessels ordered by Grimaldi Group, Italy. The contracts are valued at more than US$47.8m and include an option for three additional vessels increasing the total value to more than US$59.7m. Due for delivery from 2020, the new vessels will be 238m-long, with a beam of 34m and gross tonnage of 64,000 tons. Nine vessels will be able to transport over 7,800 linear meters of rolling units, equivalent to about 500 trailers. The contract includes an option for three additional vessels (a capacity of 5,800 linear meters of rolling units). 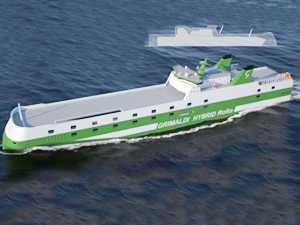 The contract scope for the vessels, which are known as the Grimaldi Green 5th Generation, includes supply and integration of large battery systems, shaft generators, frequency converters and energy management systems. Deliveries will start mid-2019 and are expected to be completed within 2022.